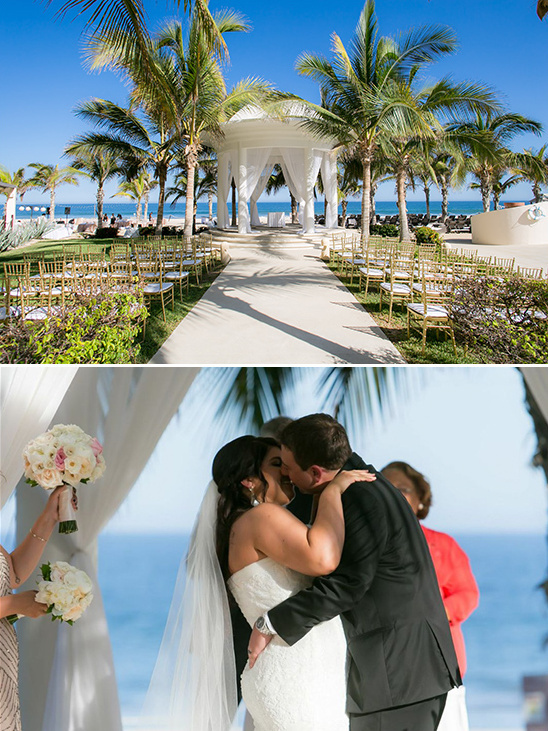 Cabo is a beautiful and vibrant destination wedding location, and our next feature will make you want to escape to the beach. 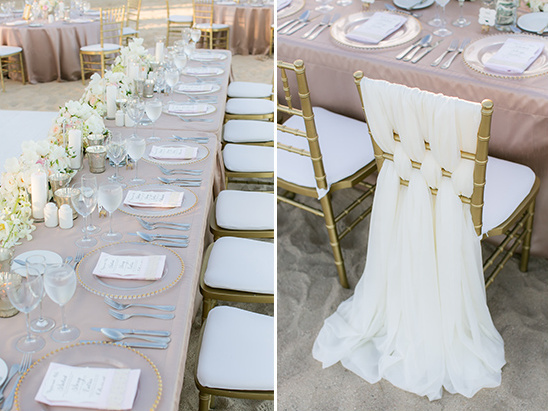 Event designer, Sweet Pea Events brought the casual beauty of the beach and the classic elegance of weddings together into one stunning affair. You will simply love it. 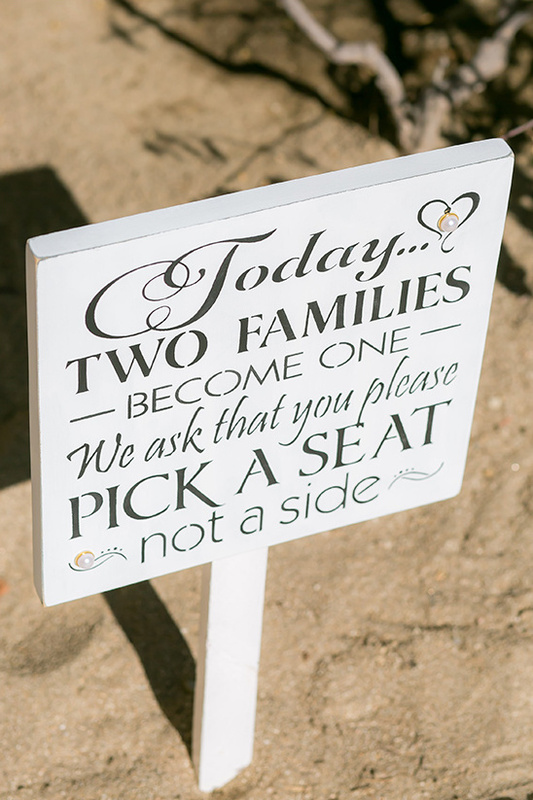 Keep your eyes peeled for some super cute ideas ranging from an "I spy" scavenger hunt to signs inspiring guests to embrace the beach. 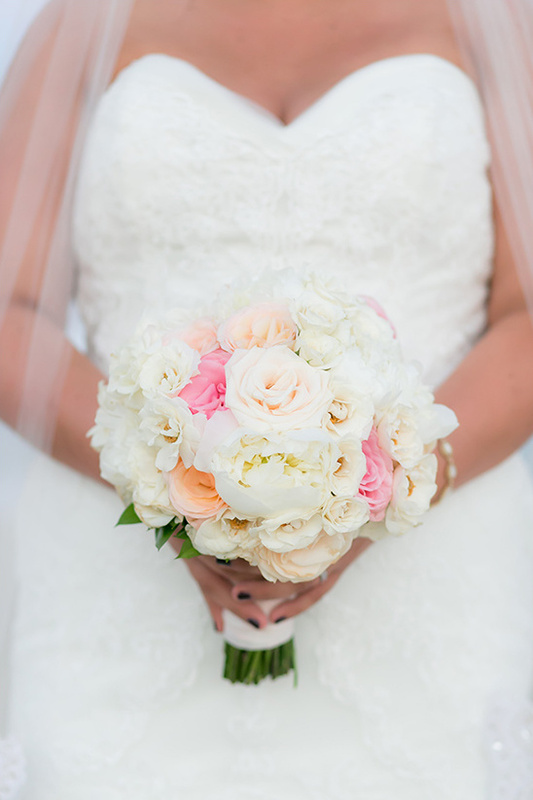 Soak up all this lovely day has to offer in the full gallery here, captured by Ana & Jerome Photography. 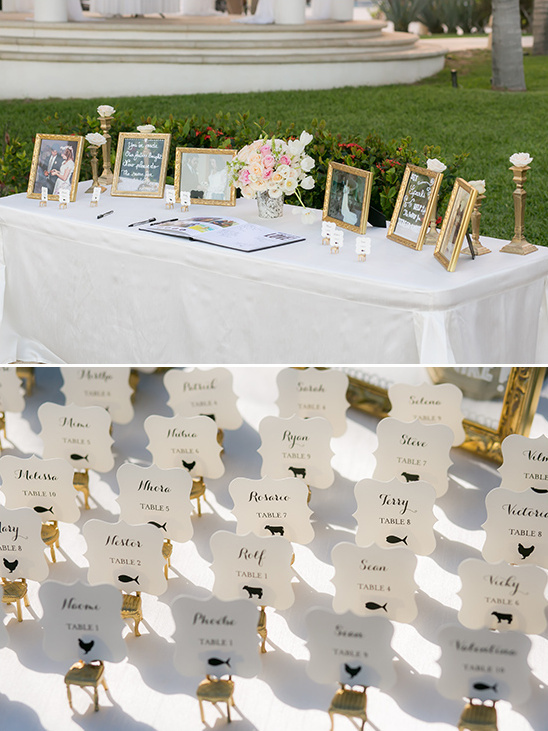 Our families are literally spread all over the world and we knew that we wanted our wedding to feel like a mix of a family reunion and wedding celebration. 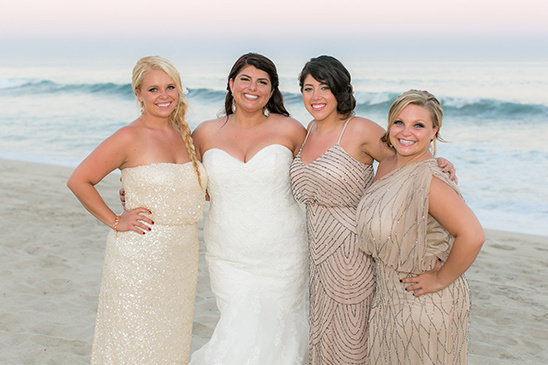 We could not imagine getting married without everyone in our family gathered around us. No matter where we decided to get married, we knew that everyone in our family would have to travel to get there so we figured why not travel to somewhere that is exceptionally beautiful? 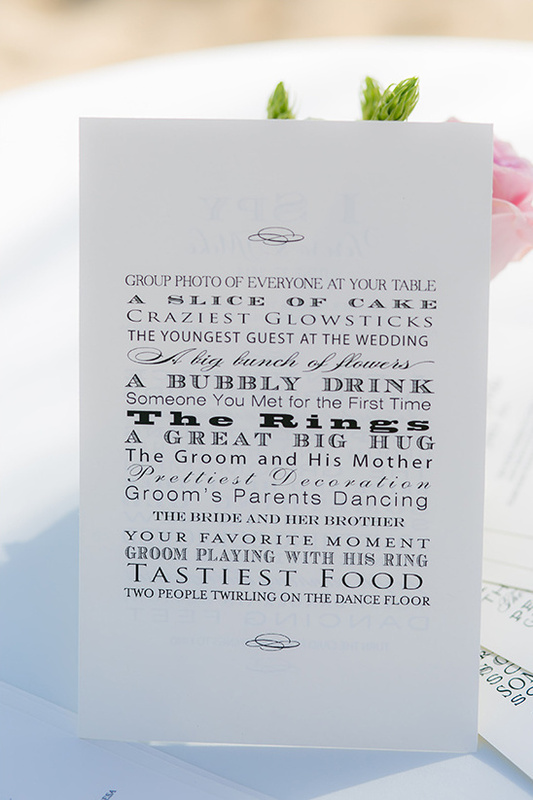 For the design of the wedding… my inspiration was actually something my dad said to me. My mom passed away when I was 16 so when it came to looking through Pinterest and wedding blogs…my dad was forced to participate with me. After showing him wedding after wedding he finally stood up, said something along the lines of “I like that formal look thing that juxtaposes with the causal beach location,” and walked away. That was his two cents and I took it to heart. So our theme of "juxtaposition" was decided. I knew I wanted the decor to be soft, romantic, warm, and elegant… but not stuffy or formal. My husband and I are not into formal affairs at all… for our menu I requested french fries be one of our sides…so throughout the whole planning process I kept reminding myself to not get so caught up in what everyone thinks a wedding should be…I just kept thinking would kind of party do my husband and I want to have in order to celebrate our marriage. However in order to keep with our juxtaposition theme we decided my husband and his groomsmen would wear tuxes and my bridesmaids would wear long evening dresses. 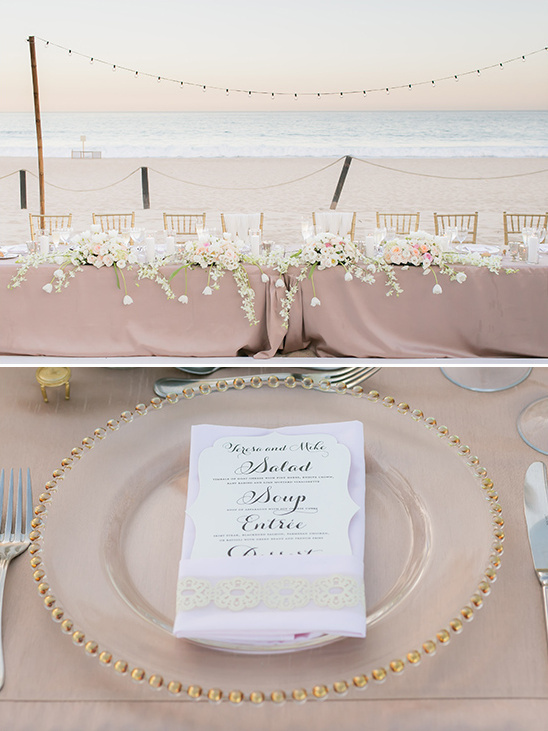 The only thing I would really change about my wedding is that I wish I had taken a few minutes to walk around my reception and really take notice of all the small details that myself and my wedding planners worked on. The reception honestly went by so quickly that I totally forgot to look at all the beautiful decorations! I never saw my entry table...or the cocktail tables or the shoe stand.... 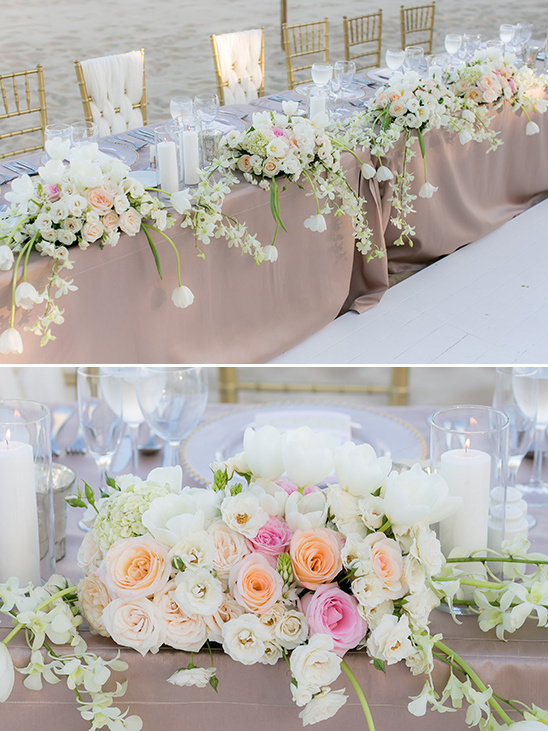 I really wish I would have taken just 5 minutes to walk around the reception and look at the wonderful details and decor we had been creating for over 2 years. See their day come to life here, filmed by Dino Gomez. Keep reading to see the proposal story, the wedding planning journey and more insider info from their big! My husband proposed to me exactly 20 minutes before I had to leave for my college graduation in May 2012…to say it was an exciting day is understatement. Once graduation was over we finally had a chance to talk about our wedding. I come from what could be called a “modern family” where he comes from a more “traditional family” so I knew a “normal” wedding was probably not going to be best for us. My family is Colombian and his family is Swiss and American so we needed somewhere that would cater to both of our cultures. 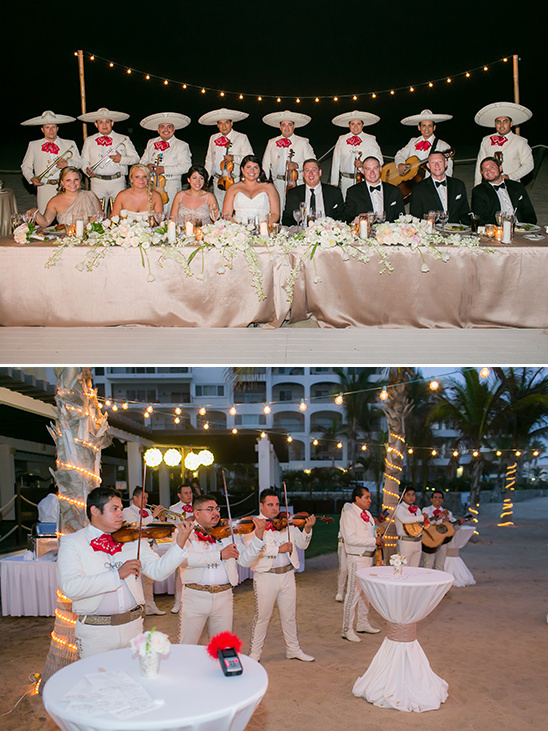 After stalking Style Me Pretty like every newly engaged girl does, I saw so many beautiful destination weddings in Cabo that I knew Cabo would be perfect. The laid back culture, the cliffs overlooking the clear water and the … well, Cabo stole our hearts. Our wedding day was warm…and not just in temperature, even though it was very hot, but also in feeling and mood. 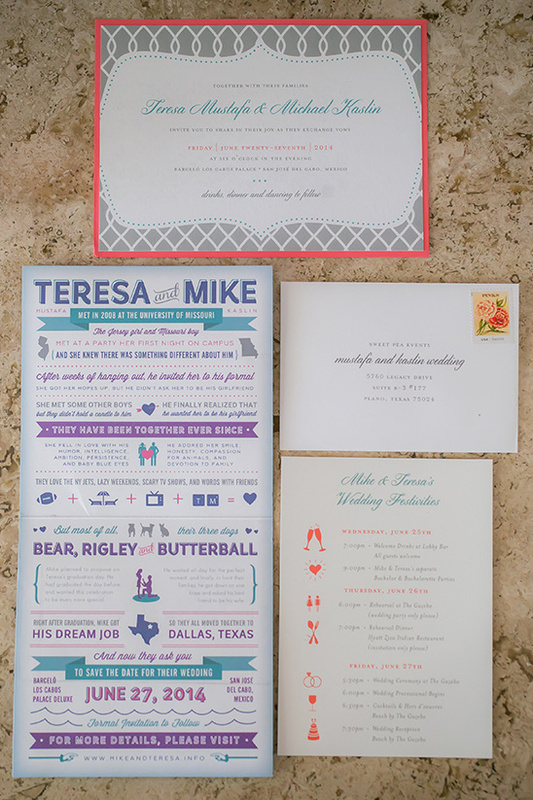 We really wanted to make sure our wedding ceremony and reception was a true reflection of us. We knew we wanted to be legally married in Cabo and since the legal ceremony has to be spoken in Spanish, I asked my father's twin to be our translator/officiate. I come from a superstitious family so the first time I saw my husband was when I turned the corner and started walking down the aisle. Neither myself nor my husband are comfortable being “romantic” in front of other people… we just get so hilariously awkward and weird!... so having to say such personal things like our vows in front of our families was not easy but we did what we usually do- we made each other laugh and smile the entire time. Throughout the reception, my husband and I would find each other through the crowd of our 80 guests and just take a moment to look around and really appreciate that all of our closest friends and family were all in the same place at the same time. Most of our families had never met each other and we knew that since everyone lives so far apart it would be unlikely that we would ever have another chance to have everyone we love in the same place. 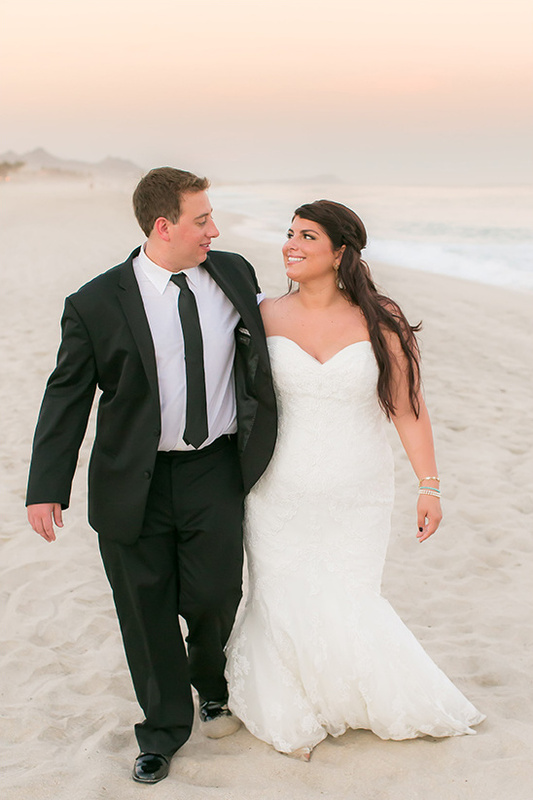 Seeing everyone we loved dancing and celebrating my husband and my commitment to each other under the beautiful Cabo night sky was honestly the best part of our wedding.